Kabe Statue and Muftak Statue from Star Wars Episode IV: A New Hope. Enjoy these highly detailed, limited edition, cantina-creature mini busts! Regulars at the Mos Eisley Cantina, make them regulars in your Star Wars collection! Awesome Star Wars statues! The Kabe Statue and Muftak Statue are from Star Wars Episode IV: A New Hope. Hand crafted and cast in high-quality polystone, no detail was overlooked in creating these fabulous Kabe and Muftak Mini Busts that measure 5-inches and 7-inches tall, respectively. The limited edition cantina creatures are shipped together in a 2-pack box, with matching edition numbers and a certificate of authenticity. 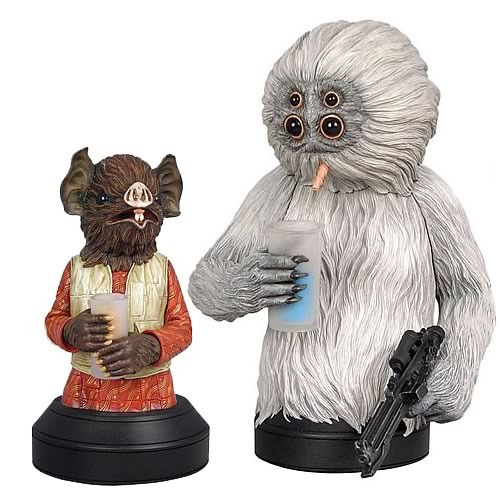 Make the Kabe Statue and Muftak Statue regulars in your Star Wars collection! Limited edition of 1,400 pieces. The hulking Muftak and his sidekick Kabe are two of the Mos Eisley Cantina's longtime regulars. Nearly inseparable, they're known as common pickpockets and thieves, with Muftak providing the brawn and Kabe the brains.